The kind of project everyone needs once in a while. I’ve traced and cut this top yesterday evening and was at my sewing machine at 8 in the morning finishing it. Can’t remember the last time I did sew so early in the morning. I’ve given myself a day off. Have spent my morning sewing, chatting to my mother on the phone, baking bread rolls. A quiet morning on my own. Children will be home later in the afternoon, but for now, feels good to do everything at my own pace. The top is from the Vogue 1141 (OOP) pattern. On PatternReview there are a few reviews from others who bought the pattern for the top only. Which I can understand, as the rest of the garments don’t speak to my imagination. This top is (almost?) the same pattern as the top from another OOP pattern which I had been searching for a long time (V2925). 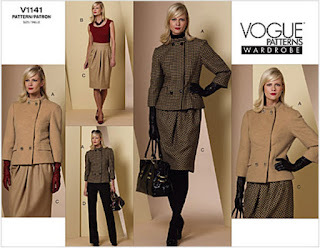 I learned from reviews that the top in Vogue 1141 was the same. I saw this pattern for sale on a Dutch site and placed a bid on it. To my surprise (and probably the sellers too, we both use different names on the site), the seller was a blog reader I had been in contact with about patterns in the past year and she sent me the pattern for FREE. Thanks again Ruta. The larges size in the envelope I have is a size 12, which I would normally think is too small. I compared the pattern pieces with a very close fitting top that I wear under jackets and it was quite a few centimeters wider than that top. Which made me decide to go with the size 12. It is a close fitting top, but not too tight. There are gathers at the side to give some extra bust space. If the fabric has less stretch I will do a small fba next time. In the back the fit is very good. Though I can’t show you now, I have only dressform photos. Most of the photos are made lighter, to show the details of this very black fabric. The pleats at the top are the main feature of this pattern. A lovely detail. And tonight I will wear it with this (rtw) skirt. It’s Sinterklaas (December 5th) in The Netherlands, but as our children are not small any more we are going out for dinner with the family tonight. For my Dutch readers who do have the “Sinterklaasfeest”: have a very happy evening. I like the shirt pattern. You are right, it is the best pattern out of the whole wardrobe! The navy blue colour looks good too. I haven't seen Navy Blue used much in clothes for a while, and now it looks very fresh and just right to me now. I was out ice skating with the kids this weekend and there were many young women there with navy blue wool coats and it looked fantastic. That's a pretty top. Perfect alone, or worn under a suit jacket. I love the look of that top - can't wait to see you wear it. What kind of knit fabric did you use? It looks like a fairly stable knit but your comment suggests that it may not be so. That is a very cute top! Wij vieren nog altijd Sinterklaas. Het is het hoogtepunt van het jaar, al vieren we het bijna nooit op 5 december (ivm met mijn zus in Londen). 'Dit' jaar wordt het 1 februari :-). Leuk dat jullie uit eten gaan, geniet ervan! Hi Sigrid! I love your top! Those little details the shoulder and side gathers really make it special. 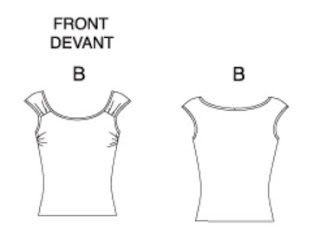 Can you tell me how did you finish the neckline and armholes? Did you fold the band lengthwise and serge on 3 raw edges? that looks really good - I liked the pattern when you showed me. That looks like a great pattern, and something easy and simple and rewarding is always a great idea after a hard project! Love your new top! This is such a lovely top. Simple but really nice details. I think I might (one day) try and draft one from a simple tshirt pattern. Shouldn't be too hard..I hope :) I am going to pin it for inspiration and a reminder. I like simple lines of your top and expect that it will be quite versatile. Great top with just the right amount of soft detail. Sometimes quick projects are the best ones! Quick projects are so fun to take my mind off things. This is a very cute top; I like the shoulders. Happy holidays! Your top is so lovely, feminine but not fussy. I have wanted to make this top for years. You have inspired me to pull out this pattern and sew it. Really nice. I have the pattern too. I am definitely going to take a second look at it. I love the pleats at the shoulder. It's a beautiful classic top, I can see why people would buy the whole enveloppe juste for this one - though you'd have to be very attentive since you can't see the top really well on the enveloppe. Hope you had a wonderful Sinterklaas! I've had your blog bookmarked for a while now but never got around to reading, however, since Novemeber 24th, I have read your entire blog right from the beginning. I haven't commented on things along the way as I thought it would seem a bit strange commenting on a post that could be a few years old. I love the style of your blog writing and the balance of finished garments and WIP. I especially love the gorgeous ling erie that you make and share. It's been interesting to see your personal style develop and become more cohesive over the time frame of this blog, too. Lovely top for all the reasons you described in this post.